Gemstone King : For over 100 years my great grandfathers company has been the leader in Diamond dealings throughout the world spanning from our locations in Belgium, Israel and my office located in New York and we owe it all to our valued & loyal customers. At Gem Stone King we strongly believe in offering 100% customer care, which is why you can find that we have over 200,000 positive transactions, which represent 200,000 satisfied customers. Listen don't just take my word for it, here's a look at what some of our loyal customers had to say about their buying experience with Gem Stone King. 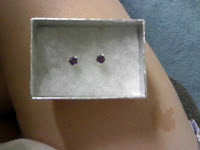 I received the Purple Amethyst Earrings to try and review from Gemstone King a $9.99 Value. I have always loved the color of purple amethyst, The color is soft but yet mesmerizing. These earrings would make any outfit shine. Rather it be casual, work, or a romantic dinner. These earrings would be a great Christmas, Birthday, or any celebration. These earrings would be great for any woman in your life that loves jewelry also. The color of these earrings are a dark purple that are placed with sterling silver backings. These earrings are the perfect size. I have bought other earrings somewhat like this before and they were over-sized or not big enough. I have had many compliments while wearing these earrings. These earrings come in a cute silver snake skin looking box so If I want I can gift these to another jewelry lover like me. Gemstone King has tons of pretty jewelry for that loved one in your life or find something for yourself at great prices. ♥ I receive no monetary compensation for this review. I was provided a earrings to try and give my honest opinion.